REU alum Naomi Huntley, Michael Wooster and Mia Thomas present their research at the 13th annual International Coral Reef Symposium. Photo by Ali Hochberg. The 13th annual International Coral Reef Symposium (ICRS) convened in Honolulu, Hawaii in June with more than 2,500 scientists, policy makers and managers in attendance from 70 countries. The conference theme ‘bridging science to policy’ provided students and professionals with the opportunity to communicate their recent findings and ongoing research programs to an audience with the shared goal of improving coral reef conservation through the application of science. BIOS associate scientist Eric Hochberg co-chaired a session on remote sensing of coral reefs, during which he gave a presentation about the NASA-funded COral Reef Airborne Laboratory (CORAL) mission (of which he is the Principal Investigator). 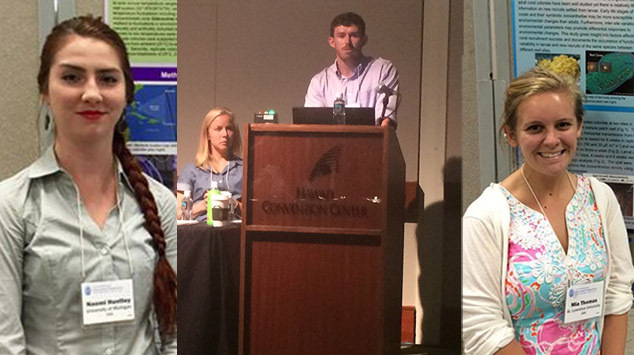 This symposium also saw three BIOS alums from the NSF Research Experiences for Undergraduates (REU) program. Michael Wooster, Naomi Huntley and Mia Thomas (pictured) presented their research in both oral presentations and poster sessions, demonstrating the positive impact this program has on the careers of young scientists.